[By Nick] I never really realized how many different sugar free/no sugar added products there are on the market nowadays. Ever since my positive experiences with Clemmy’s, I’ve been more open to seek out these options in the freezer isle. I noticed that the folks over at Klondike make a couple of their iconic bars in no sugar added versions. So with my new found curiosity and some requests for more no sugar added products, I picked up a package of their vanilla no sugar added bars. I do remember seeing these come in a box a while ago but I do like the change to the traditional Klondike packaging. I never liked separate packaging for different subsets of products. For those who can no longer have the original varieties, I can imagine them feeling excluded with the old packaging. With the switch, if you didn’t read the name you would think it was just a normal old Klondike bar. The same holds true when you remove the bar from the wrapper. There’s really nothing different visually from the original bar. Cutting it in half, the shell does seem to be not as thick though. Taking a bite, the first and only thing you taste is the chocolate shell. From what I remember, it is very reminiscent of the regular bar and has a nice crunch even with the lack of thickness. The problem here is the vanilla ice cream because it is basically tasteless. Even sampling it alone, you can only barely get a hint of vanilla flavor. I know what you’re saying, “it’s has no sugar added, what did you expect?” Well seeing as Clemmy’s Vanilla Bean was really good; I was expecting a decent amount of vanilla flavor. 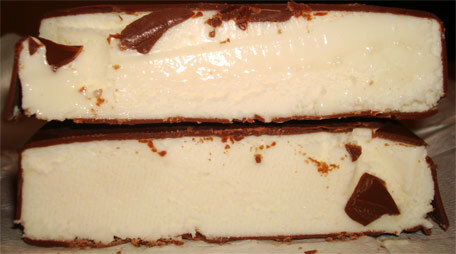 Seriously, Klondike has no excuse for using such a bland vanilla ice cream when Clemmy’s can do it. 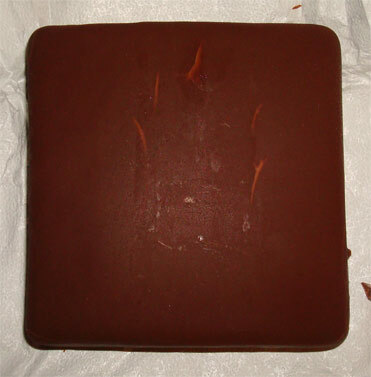 As for the texture, it’s not as dense as a normal Klondike bar but at least it still had a bit of creaminess to it. If you have some sort of dietary restriction where you couldn’t have sugar, I would recommend these for the nostalgic flavor of the shell. If only the vanilla flavor wasn’t nonexistent, I would have no problem recommending this bar to anyone looking to cut their sugar intake. As is though, I’d rather just eat half a normal bar and cut the sugar that way. I used to eat NSA ice cream stuff. Then I learned how sugar plays such an important role in the freezing process, and realized how much smoother ice cream is without gums, and how much better my guts feel now that they're not trying to process SAs. If you're looking for a good low sugar ice cream, I'd suggest French Vanilla. It's typically the lowest sugar regular ice cream due to the egg yolks. Thanks for a NSA review Nick! Now I know to skip these. I buy the Clemmy's because of your review and always enjoy it. Adam, I have no need to reduce my sugar intake. I just like branching out and trying things other might be interested in knowing about. Beth, no problem! Any other nsa products you would like for me to give a try? Jrdunn, klems? I can't seem to find anything about them online. Could you please link me to the product you're talking about? I've never seen Klems or Clemmys. I and millions like me are diabetic and cannot have anything but no sugar or no sugar added treats. I love the Klondike bars both regular and Krunchy and thought they were delicious. When you cannot have sugar you don't compare the real to the no sugar added, you are just so thankful to have the treat. My son was diabetic from age 3 and always felt different, he couldn't eat the cake and ice cream at birthday parties, he couldn't eat the sugary Halloween treats, he came home crying a lot. Had they had Klondike bars and the no sugar added ice creams they have today I could have been sure he didn't feel "different" or left out. Negative comments from those who don't have to have no sugar added treats have a negative impact on the manufacturer. I learned today that they are discontinuing no sugar added Klondike bars and I am heartbroken. If you can have sweet treats please stay away from commenting on the no sugar added treats, you do all of us who rely on them no favors by doing so. Brenda, we are sorry for your troubles and as the dad of someone with multiple food allergies I deeply understand the frustration of the "feeling different" issue. That said, Klondike discontinuing these is not our fault. Klondike has long been on the decline with their quality. The readers asked us to cover some non-sugar stuff and we obliged. It's not our fault they are too cheap to put in enough vanilla flavoring to make this a viable treat. Ok, that said, it's a brave new world out there and there are so many more options than there were five or ten years ago. I don't know your particular status, but no and low sugar treats are very much a market segment now. Enlightened, Halo Top, Arctic zero are all low sugar options now. Even high end graeters offers up low glycemic options now. Breyers still has there no sugar added line up. There are others. Again, I don't know your particular circumstances, but visit a few different stores, check boxes, see what's out there. Wait, I have one more question, who told you they are discontinued? Did you here it directly from Klondike? or from a grocery store? Sometimes a certain store might give up on them, doesn't mean they are completely gone. For example, all the walmarts in my area still have these in stock (and walmart carried the chocolate choco taco for a few years after everyone else dropped them). Not saying this is a permanent fix, just trying to help. Note: I checked Stop & Shop today and they had both the vanilla and krunch flavors of the no sugar added variety and had dates of September 2017 on them. That's not old stock, that's a pretty fresh batch. Are you sure they just arent being discontinued from your store?